Bleach Your Skin - Right or Wrong? Now days all women want to look ravishing. She uses myriad tricks to enhance her beauty by using all kinds of beauty products. Bleaching your skin is one of them. It is a process where the unwanted hair is lightened. 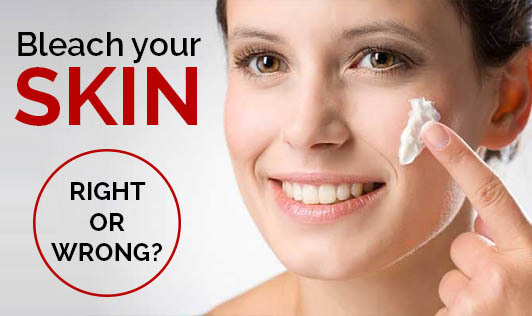 Bleaching cream is a cosmetic that is done using many chemicals. Now the question is how safe is it? It is safe to use if you use it with right direction and the best product. Bleaching cream has to be tested before applying. Bleach should be applied on your palm or your hand and wait for some time to see if some reaction happens. If that part of your skin becomes red or if you see any infection stop using it. Apply ice immediately so that it will relax and the infection comes down. If the product is working well for you, then you can apply it to your face, hands, neck etc. There are many advantages of bleaching like lightening up the dark spots. For dark people it helps them in looking slightly fair than their complexion and facial hair will look light. Bleach effect will last for 15-20 days and will make you look fair. There are side effects too. Over using it will make your skin look older, you may also develop red spots due to infection. If you have a pimple or if there are any eruptions use the bleach carefully or do not use it. You can try homemade bleach. Talk to your beauty expert to know more about your skin type and types of products that you can use. To know your skin type go to this link How Do I Determine My Skin Type? You can also go to this link to know more about the effects of beauty products on your skin. Women! Know the Ugly truth behind your make up!